At an event on 17 March 2017 The Open University’s Executive Dean, Simon Kelly, was presented with a plaque to mark their Employer Champion status. The first seven members of staff who achieved professional registration were also presented with their certificates. Among them were Registered Science Technicians and Registered Scientists. Members of staff gathered at the Milton Keynes campus to hear from Technical Manager, Julia Barkans, who played an important role in the achievement of this award. 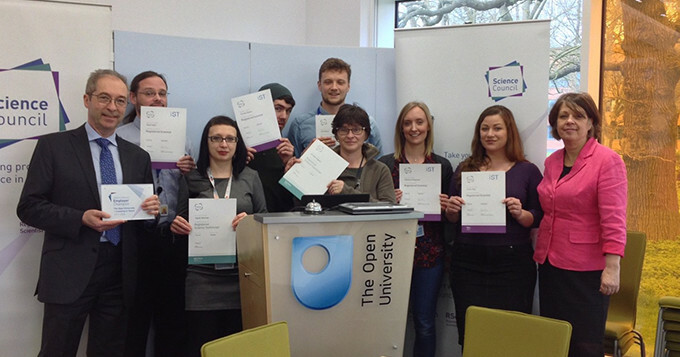 As a result of becoming an Employer Champion, The Open University will be working with the Science Council to support their scientific staff to achieve professional registration. Find out more about how the Science Council is working with Higher Education to support excellence in teaching and learning.